In one of my trips to Malaysia, I got hold of a large packet of handmade Mee Sua from Malacca. We usually make noodle soup with minced pork balls out of it but this time, I decided to fry them. 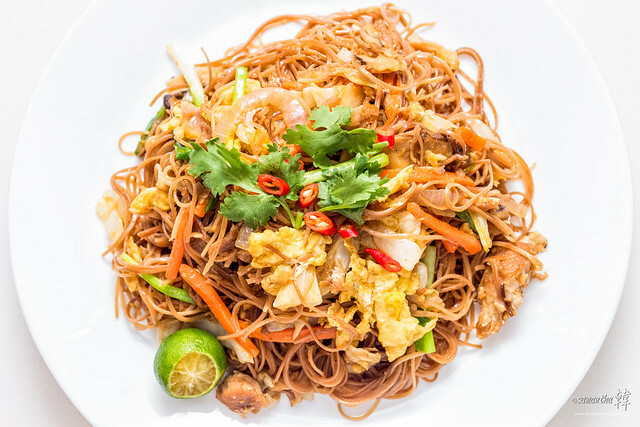 “The earliest written record of noodles is from a book dated to the Han dynasty (206 BC – 220 AD). 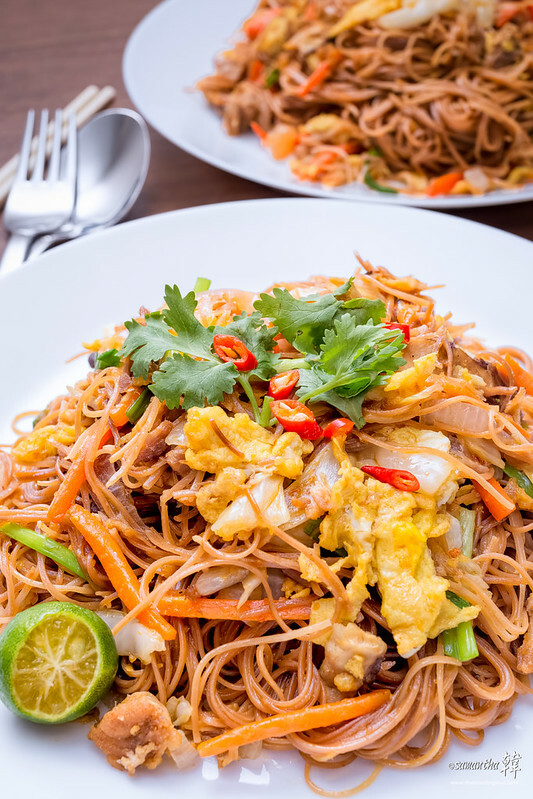 Noodles, often made from wheat dough, became a prominent staple of food during the Han dynasty. During the Song dynasty (960–1279) noodle shops were very popular in the cities, and remained open all night. During the earlier dynastic periods Chinese wheat noodles were known as “soup cake” (湯餅), as explained by the Song dynasty scholar Huang Chaoying (黃朝英) mentions in his work “A delightful mixed discussion on various scholarly topics” (Chinese: 靖康緗素雜記; pinyin: jìngkāngxiāngsùzájì, Scroll 2) that in ancient times bready foods like pasta are referred collectively as “bing” and differentiated through their cooking methods. “Misua (also spelled mee sua or miswa; originated from the Hokkien word mī-soàⁿ) are a very thin variety of salted noodles made from wheat flour. They originated in Fujian, China. The noodles differ from mifen (rice vermicelli) and cellophane noodles in that those varieties are made from rice and mung beans, respectively. 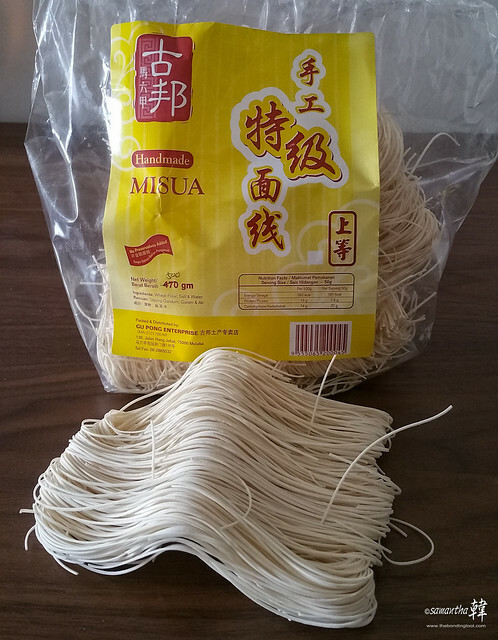 Misua are also typically a lot thinner than those two noodle types. Cooking misua usually takes less than two minutes in boiling water, and sometimes significantly less. The ones I got from Malaysia were sold in large packets without any red string tied to it. 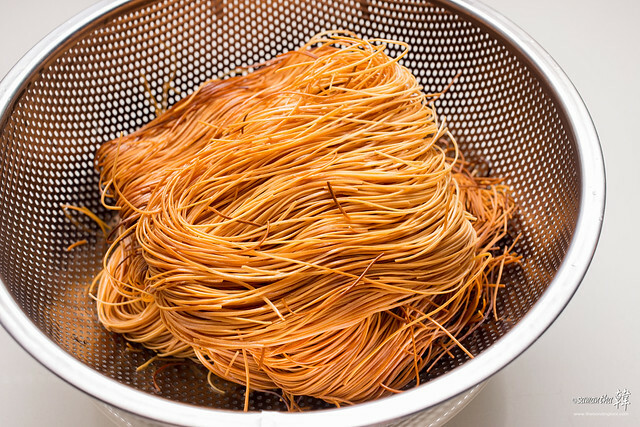 The processed dried noodle is very fine and brittle so it must be handled gently to avoid it from breaking into pieces. There are many brands of Mee Sua in the market and they are usually sold in boxes. The ones I got from Malaysia were sold in large packets without any red string tied to it. Mis en place for Fried Mee Sua. Here I have used canned stewed pork but you can choose from sliced beef, chicken or pork. You can also use Charsiu (Chinese BBQ pork or Siew Yoke (Chinese roast pork belly). You may substitute meat with seafood like prawns, squid and firm fish fillet. Omit eggs, meat and seafood to enjoy a vegetarian variation. Do not use garlic if you’re on strict long-term vegetarian diet. Have a kettle of water boiling as you are frying the mee sua. It is best handle one skein of noodle at a time as they brown very fast. Heat some oil (just enough to cover one skein of the mee sua) over medium low heat. Fry until both sides are brown, about 30+- seconds on each side. Once both sides of the mee sua are browned, carefully lift it onto a paper kitchen towel lined plate or colander (as I have here) to drain off excess oil. Repeat until all skeins of mee sua are cooked. 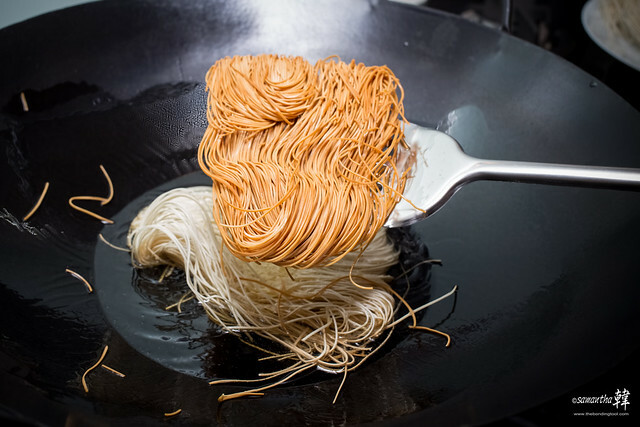 Transfer fried mee sua into a huge bowl and pour hot water to completely submerge them. 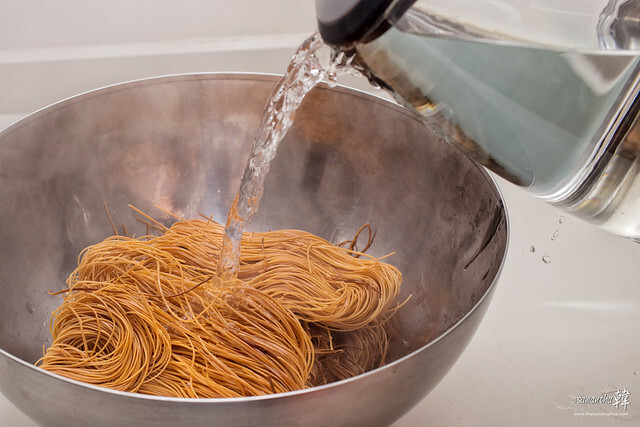 Be careful when pouring as there may be bubbling when the hot water touches the oily noodles. Do not stir at this point or the noodles will break up! 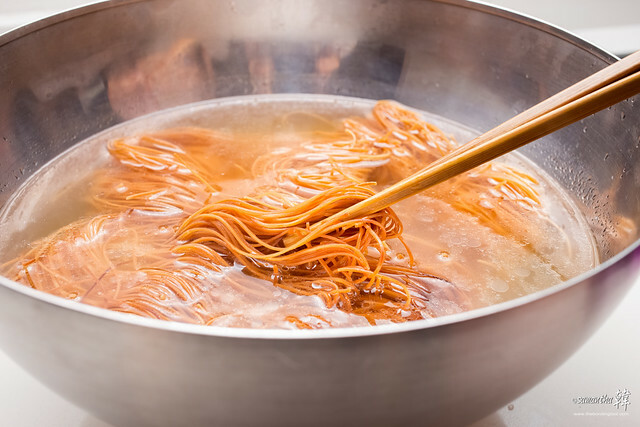 Soak fried noodles in the boiling hot water until soften (about 1 minute or less) and then gently loosen them with a pair of chopsticks. 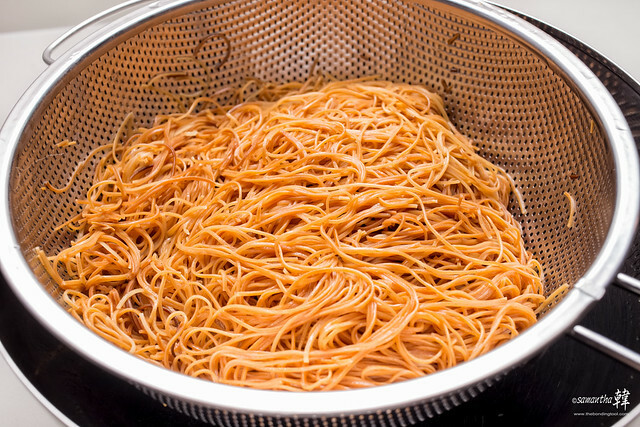 Pour the noodles into a colander to drain off water. 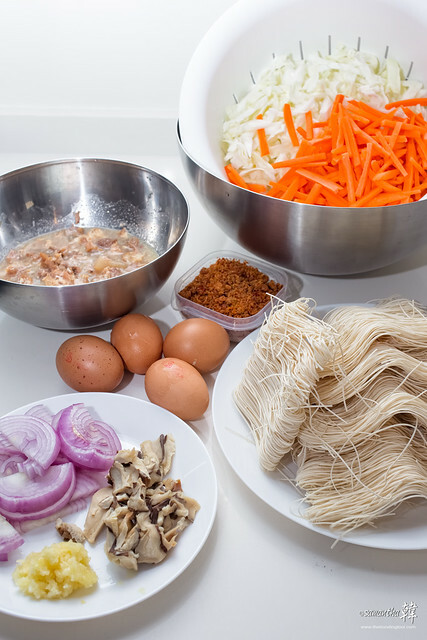 The prepared mee sua are now ready to be fried with other ingredients. 6 skeins of Mee Sua (needs preparation, see method in photo tutorials). 300gm Meat, sliced thinly (chicken fillet, lean pork or beef or canned meats or Chinese roasts). 200gm cabbage (cut to small pieces). 6-8 Shiitake Mushrooms (fresh or dried, I used *dried) remove stalk and slice caps thinly. 1 small Carrot, shredded into 1½ inch lengths (or length of bean sprouts). 2 stalks Scallion, sectioned into 1½ inch lengths (or length of bean sprouts). 50g Dried Shrimps (haebee), rinsed and pound lightly. 3 Eggs, beaten lightly for omelet. Vegetable Oil (I use Groundnut Oil). 2 teaspoons Sesame Oil, to be drizzled at the end of cooking. *If using dried shiitake mushrooms, soak them in 2 cups of boiling hot water until soften. Sieve mushroom water and reserve for use in Seasonings. Seafood – You may use a combination of fresh seafood like prawns, squid and firm white fish fillet. 1 tablespoon Light Soy Sauce, or to taste. 1 teaspoon Chicken Stock Powder, optional. 1 – 1½ cup Mushroom Water (from reconstituted dried shiitake mushrooms). Crispy fried shallots, chopped cilantro, limes, red cut chillies and/or sambal. 1 Egg White, optional (do not waste the yolk, use it in making omelet). Put everything except sesame oil in a medium bowl and mix till evenly coated. Stir in the sesame oil and keep aside for 30 minutes. Add a pinch of salt and a few dashes of white pepper powder to the 3 eggs and beat lightly. Add oil in hot wok and fry omelet. Break into pieces, dish out and set aside for use later. sliced onions and cabbage (fresh shiitake). Once all the ingredients are coated with oil, add in meat (the pre-fried fresh meat or canned meat) or seafood at this stage. If using charsiu or roast pork belly, add same time as mee sua. Stir-fry well to combine. Add seasonings and bring to the boil. Add mee sua (charsiu or roast pork belly) and beansprouts (if using). Stir-fry until noodles are dry and fluffed, and bean sprouts still crunchy. Add sectioned scallions and drizzle in the 2 teaspoons sesame oil, turn off heat and give a few quick stirs to combine. P.S. I did not use dark soy sauce. The rich colour was from the deep-frying of mee sua during prep work. Serve hot garnished with crispy fried shallots, chopped cilantro, limes, red cut chillies and/or sambal. If using fresh meat: Heat 1 tablespoon groundnut oil in wok. Add marinated meat and stir-fry until cooked on medium high heat. Dish out and set aside. I skipped this step since I was using canned stew pork. Add a pinch of salt and a few dashes of white pepper powder to the 3 eggs and beat lightly. Add enough oil into hot wok and fry omelet till firm but do not over cook them. 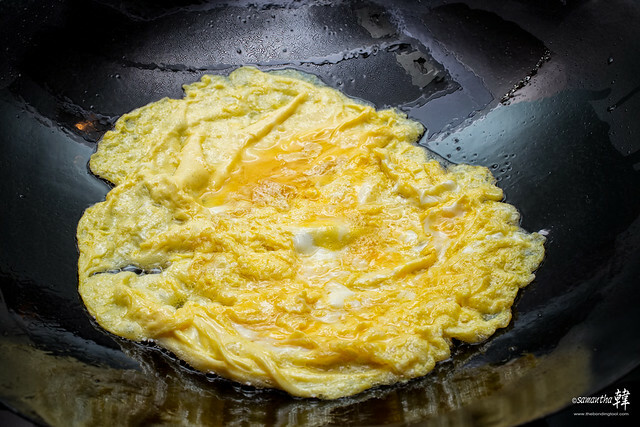 Break omelet into pieces, dish out and set aside for use later. Reheat wok with 1 to 2 tablespoons oil (I used very little oil as the canned stew meat has lots of lard in it). 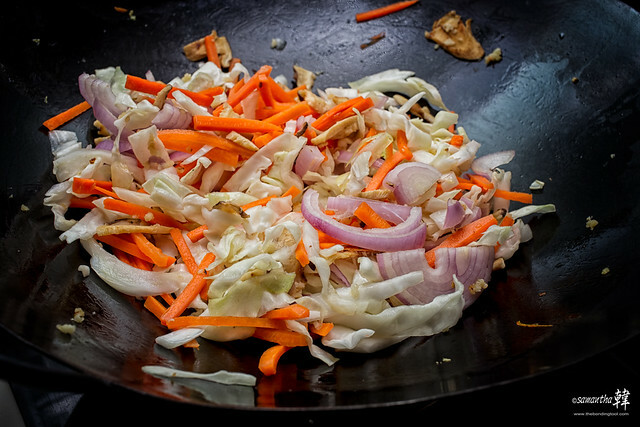 When oil is hot, add in the following ingredients and stir-fry until they are fragrant in the respective order: reconstituted dried mushrooms (if using fresh shiitake, add later together with cabbage), pounded dried shrimps, minced garlic, carrots, sliced onions and cabbage. Once all the ingredients are coated with oil, add in meat (the pre-fried fresh meat from step above, or canned meat) or seafood at this stage. If using charsiu or roast pork belly, add same time as mee sua. Stir-fry well to combine. Add seasonings and 1 cup mushroom water (if necessary add the ½ cup more) and bring to the boil. Add mee sua (charsiu or roast pork belly) and beansprouts (if using). Stir-fry until noodles are dry and fluffed, and bean sprouts still crunchy. Add sectioned scallions and drizzle in the 2 teaspoons sesame oil, turn off heat and give a few quick stirs to combine. Note: Squeezing lime over this noodle cuts down not oily mouthfeel but also savouriness. I found my plate of noodle with lime tasted “less salty” compared to other diners who did not have lime. You may need stronger seasonings in your cooking or serve cut chillies with light soy sauce. 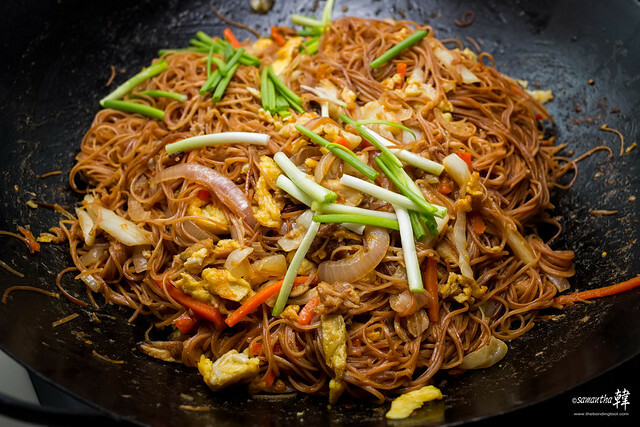 Why let tradition dictate when we eat this delicious plate of noodle? If you have made Roast Pork Belly from my previous post, you can use the leftover for this dish. Cut them into thick strips. See recipe for 100% Crispy Roast Pork Belly here.